Amongst humankind, Green Dragons are most commonly known and sadly for Dragonind, a terrible representation. Deceitful, manipulative and always causing trouble, Green Dragons have caused troubles in the lands of men for millennia. "Never Trust a Dragon" was a term first coined in reference to a Green Dragon. 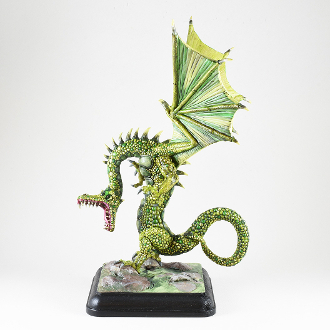 This beautiful 28mm resin kit allows you to create one of these magnificent beasts. ** Please note this is a kit. Assembly is required. A beginner level model skill should be sufficient.